Ten Richest Pastors In Nigeria 2017 And Their Net Worth. We bring to you a list many have been waiting for. 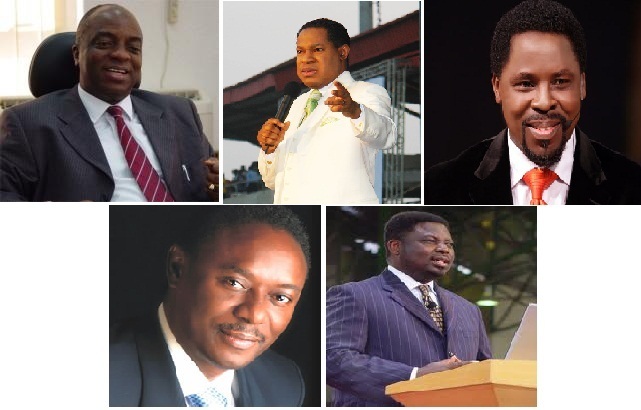 Nigeria’s richest preachers and their net worth. The people below are mostly G.O’s and Apostles. Taking a look at their financial lives this year 2018 we’ve totally noticed our Nigerian pastors are richer than we think. Well, we found out they make a lot from their salaries and mostly gifts from church members. estimated worth by net worth rankers like FORBES/RICHEST LIFESTYLE. Kumuyi worked as an education lecturer at the University of Lagos. His church is the third largest christian church in the world with hundreds of thousand members. quality cars, houses and presidential Security/protocol. Pastor Chris Okotie is the head of Household of God Church and has a networth of $8 – $12 Million. actors/actresses, musicians, and society people. the Fresh Party, a political party he founded. Pastor Chris Okotie is an automobile collector and lover. He drives a Mercedes S600, Porsche, and several other cars. interests which includes a media company. Enoch Adejare Adeboye foundly called Daddy GO is the General Overseer of Redeemed Christian Church of God (RCCG). We didn’t get to know how rich the popular pastor is until he got himself a private jet. jets, hospitals, a TV station, its printing press amongst other things. over 15,000 branches is reportedly about N201 billion naira. Africa at his Synagogue Church. LoveWorld SAT and LoveWorld Plus. worth within $80 million and $100 million. Edeh is the founder of the Centre for Peace, Justice and Reconciliation, he owns four tertiary institutions (Madonna University Nigeria, Caritas University, OSISATECH Polytechnic, OSISATECH College of Education), a microfinance bank, health institutions, museum, production company amongst other things. Ministry (aka Winners Chapel). His estimated Net worth is $180 million. worship center. He owns two private jets (some sources say four) and houses in London and the United States. Academy, a high school for the upper class.